The colors of every item should match. Incidentally, all whites are not created equal, so the only way to ensure that everything matched perfectly was to make each piece using the same yarn. My son was already in size 12-24 months and it was a bit more difficult to find an outfit in his size. Even if I found something in his size, there was no guarantee it would fit. I wanted something that I could tailor make to fit him perfectly. Baptism outfits are one of the few clothing items that become automatic family heirlooms. I was enchanted by the idea that my son could look at this outfit when he's older and say, "My mom made this!" Thus began my search for the perfect baptism outfit pattern. It needed to be something within my skill level that I could complete in a reasonable amount of time. 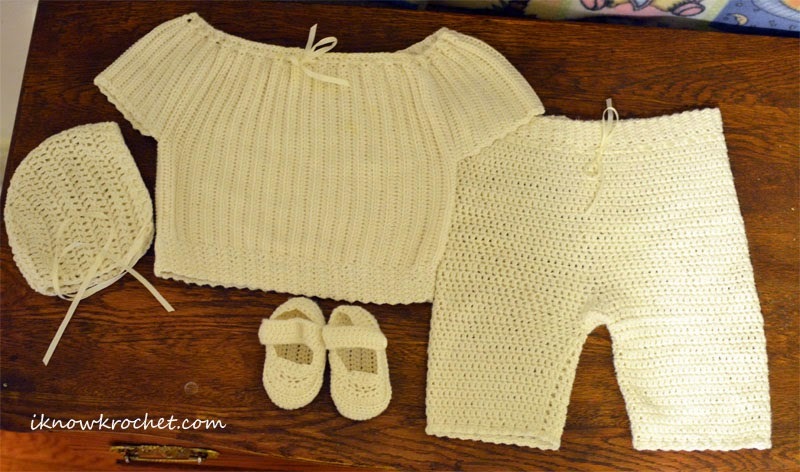 Most of the crochet patterns listed as "baptism" or "Christening" outfits that I found were written for sizes too small for my son. Additionally, although I found many cute dresses in his size that could pass as baptism outfits, it was challenging to find the perfect outfit for a baby boy. This meant I'd have to be a bit creative in assembling the perfect baptism outfit for my son. I ended up combining four separate patterns to make my baby boy's baptism outfit. I made the entire outfit using Comfy Sport yarn (#2 weight) from KnitPicks (white, SKU: 24794). I absolutely love this 75% pima cotton / 25% acrylic yarn. It is very soft and high quality. The only caveat is that it is not a pure snow white like the picture and description suggest. It looks more like a light ivory, antique white, or off-white. But it is so beautiful. I actually prefer this color over stark white. I used about seven balls (218 yards/50 grams per ball) for the entire outfit (size 12-24 months). Final measurements of the pieces are included below for reference (apparently my baby had a stocky square body shape). The color of the ribbon and buttons matched the yarn perfectly. 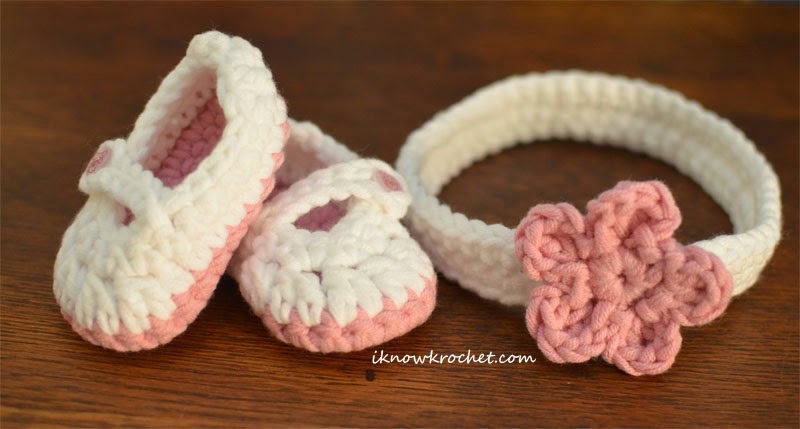 I used the same satiny ribbon in every piece except the booties. It was the perfect color to match the yarn, and was the perfect embellishment to make this outfit special. I made sure to heat seal the edges to prevent fraying. Two antique white shank buttons for booties (11 mm). The only modification I made to this pattern was using a sport weight (#2) yarn, rather than the worsted weight suggested in the pattern. The piece that really made the outfit was the top. 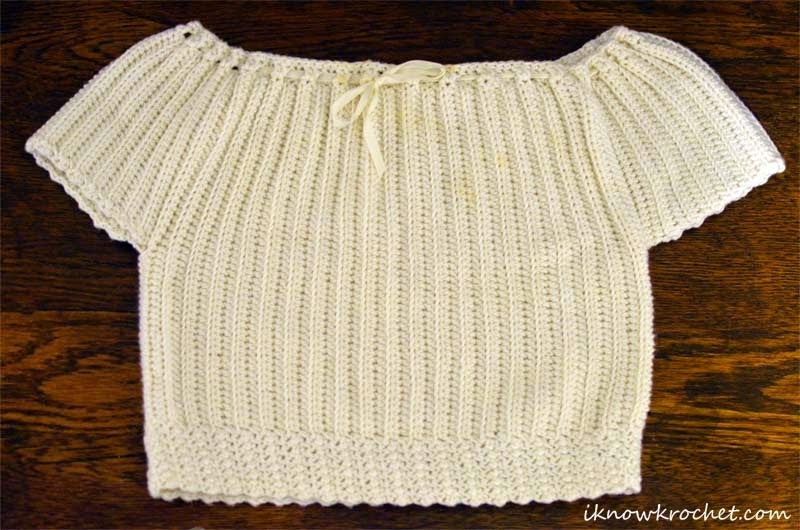 It's a peasant top that has a combination of simplicity and embellishments to be perfect for a little boy's baptism. I tailored it to fit my son, which was easy because the pattern is based on measurements. The only "modification" was a mistake I made on the edging. My mistake was that I crocheted the edging on the wrong side (the side farthest away from me when crocheting in the round). Consequently, the beautiful part that was supposed to be facing the outside ended up on the inside. I could have just turned the top inside out, but I didn't want the seams to show, so I just kept it the "wrong" way, which was still quite beautiful. I included seven rows of edging, partly to add some length because my original measurement only went to my son's waist and I should have made it a bit longer. I added a row of edging to the arms to match. 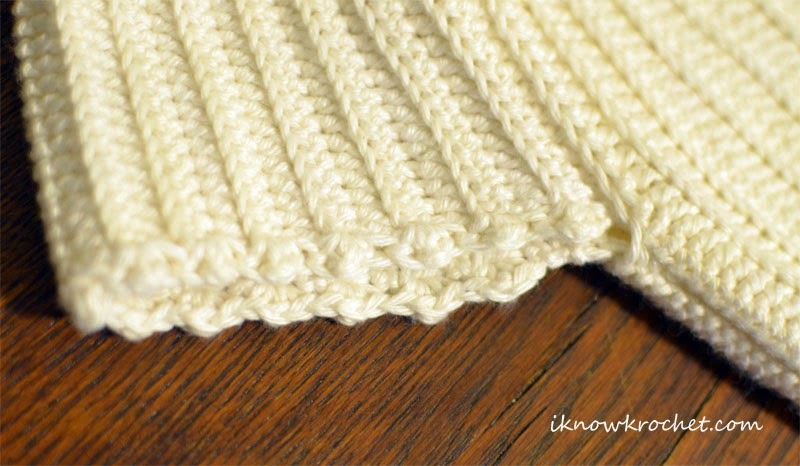 Tip: when crocheting in the round, make sure that the side you are working on is closest to you to ensure that the right side of the stitch is facing out. This is particularly an issue when joining yarn to add edging or start a second leg in the pants (I also made this mistake in the pants and had to redo a huge section). I used ribbon to cinch the top. My son had very pudgy arms, so I had to make the top wide enough to accommodate them. Consequently, due to the pattern design, I had to cinch the top quite a bit to fit him. It was a bit bulky around his shoulders, but was still absolutely adorable. However, if I make this top again, I will err on the side of snug-fitting arms rather than adding rows for "moving room." 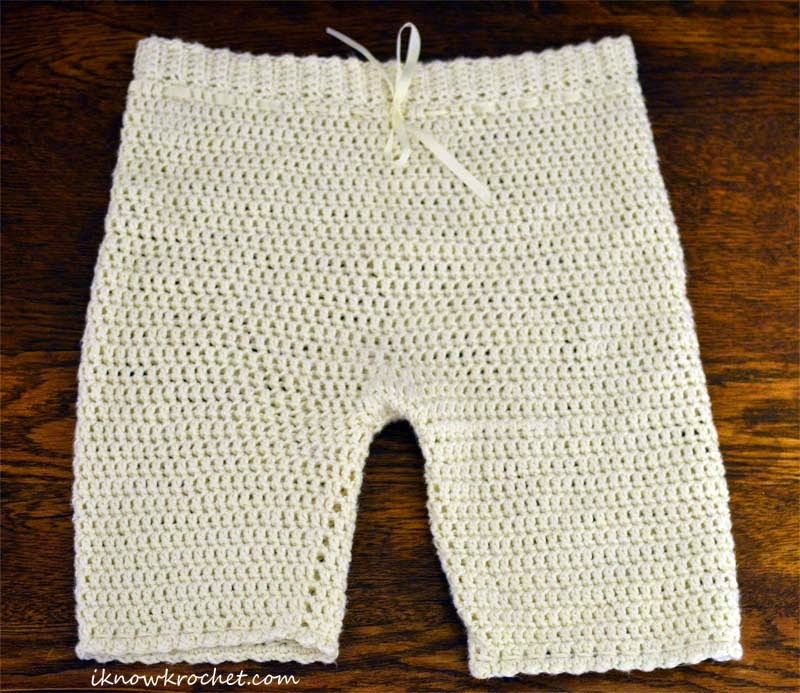 I followed the 18-24 months longies pattern, but tailored it to match my son's measurements, substituted half double crochet (hdc) in place of single crochet, and used a different pattern for the waistband. I chose this pants pattern because it includes an extra space between the legs (the "gusset"), which is a great feature to allow for more movement. I made the waistband following this ribbed boot cuffs pattern at Inspired Nest. I followed the pattern up through the foundation row, which is the connection between the ribbed waistband and the rest of the piece. After the foundation row, I continued with the longies pattern for the rest of the pants. Once the legs were approximately ankle length, I finished by adding a single row of the same edging from the peasant top at the bottom of the pant legs. I made these pants using a 4.5 mm hook in order to allow for stretching, in addition to getting it done more quickly. The finished piece was a bit too stretchy. I would probably use a smaller hook next time I crochet these pants. I searched far and wide for baptism booties, and finally decided to use the beautiful pattern I already had (see last week's post for more pictures of these adorable loafers). This was a decision based partly on saving time and money. If I had more time to try a new pattern, then I may have used this pattern, which is a perfect match to the ribbed peasant top. In the end, I was happy with the way the booties turned out. Since I was using sport weight yarn and the pattern was written for worsted weight, I had to modify the pattern slightly to fit my son's foot. He was already wearing the 6-12 months size (largest size provided in the pattern), so I increased the size by adding stitches to the main pattern. See my Tips and Techniques page for a description of how I did this. In addition to adding stitches to increase the size, I added one extra row at the top and a wide strap (2 hdc rows) to try to help the booties stay on better. In the end, they were a bit too small (I underestimated the necessary size increase and didn't have time to start over). The smallness made them fall off more easily, despite the addition of the strap, but they stayed on long enough for cute photos. Look how perfectly the button matches the yarn! In the end, I had a beautiful crocheted baptism outfit for my son. The top took by far the longest time to make (several weekends). The bonnet and booties only took a few hours total, and I finished the pants in a single weekend. Although the outfit was only worn once, it was well worth the time to make this special family heirloom. This would have been a much faster project if it had been for a newborn baby. 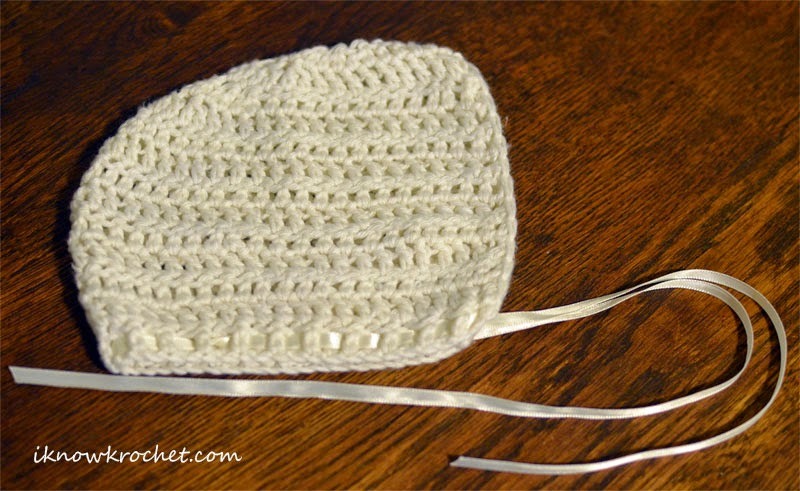 If you are planning to crochet your child's baptism outfit, what size will you make? I taught myself to crochet in order to make cute items for my kids. Because I am sentimental, I wanted my first ever project to be something I made for one of my own children. Well, that ship sailed when I sent off the bulky newborn set to my good friend. However, my second project was booties for my young son. Ideally, I would have learned to crochet before he was born so that I could have dressed him properly for a newborn photo shoot, but I also missed that boat. 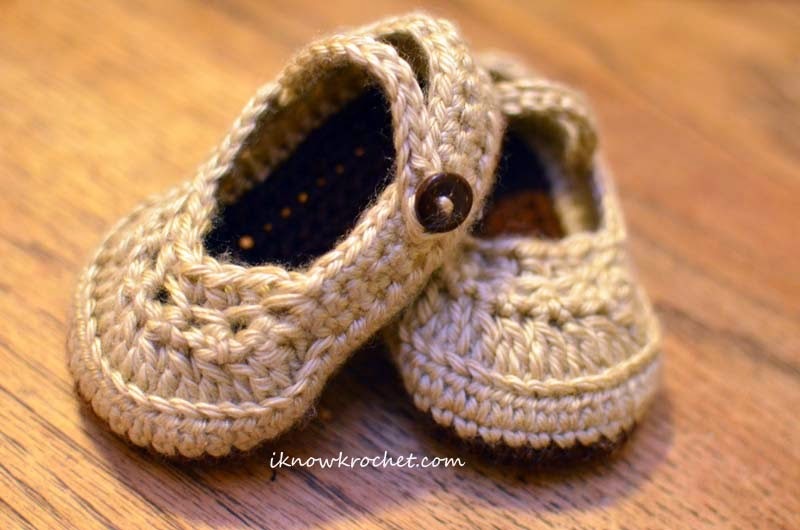 My son was wearing size 6-12 months by the time I crocheted his first booties. I wanted his booties to be adorable, but not too frilly. I had a hard time finding cute booties patterns for boys. Yes, there are many unisex patterns out there, but many of them tend to be a bit generic. Where could I find something as cute as Mary Janes, but intended for boys? The answer for me was...Etsy (again). I just love the crochet patterns featured there. The pattern I selected was from The Lovely Crow, which is also the source of the booties I blogged about last week. Actually, I had bought these two patterns at the same time so that I could get a two-for-one deal (two patterns for $10.75 rather than $5.95 each, for a savings of $1.15). I still swoon every time I see a picture of these booties. The pattern was very easy to follow. I finished the booties very quickly. I opted to keep them simple, so I left off the buttons and optional trim on the toes. Even though I did not add the buttons as embellishments, I did add a strap and button (see below). A bonus of this pattern is that it comes with a video tutorial that includes a very clever and fast technique for sewing on buttons. Worsted weight (#4) yarn: I used Caron Simply Soft, as suggested in the pattern. The colors in my photos are "bone" and "chocolate"
These booties are loafers, which I call the male equivalent of Mary Janes. They are designed such that a relatively large part of the top of the foot is exposed. Although this is extremely cute (especially on chubby feet), there is a drawback: they fall off pretty easily. I would not call this a design flaw, per se; it's just what happens when you put a loafer on a baby. I made an attempt to correct this by adding a strap. The strap was not part of the original pattern. If you already have a booties pattern with a strap that you like, then that would probably work fine for this. I wanted the strap to be very simple, so I made a chain and used slip stitches to add a button loop. Chain 18 (or to desired length), slip stitch in 5th chain from hook and continue down to the first chain, fasten off and secure loose ends to the inside body of the bootie. Add a button on the other side of the bootie using the technique described in the tutorial that goes with the bootie pattern. I must say that even with the strap (which helped a lot), these booties still tended to slide off of the heel. I suspect this happens with many booties that do not cover the ankles and include an ankle tie. I still love them, especially for photo shoot purposes. The next time I make these, I may add a much thicker strap. Incidentally, The Lovely Crow offers a pattern, Little Prince Loafers, that looks almost identical to these, but includes a wide strap. They are also very cute baby boy booties, and probably stay on busy babies a bit better (yeah, I like alliteration). form (i.e., cuteness for photo shoots) or function higher? The first project I ever started was a wavy chevron blanket for my preschooler (see last week’s post for a link to the pattern). The first project I ever FINISHED was a set of bulky Mary Jane booties and matching headband for my good friend’s baby girl. Almost immediately after learning to follow patterns, I formed a list in my head of all the projects I wanted to complete. At the top of the list was a gift for my friend’s newborn baby. I found a ton of free booties patterns online, but I didn’t find the perfect one until I stumbled upon a selection of amazing patterns for sale at The Lovely Crow on Etsy. 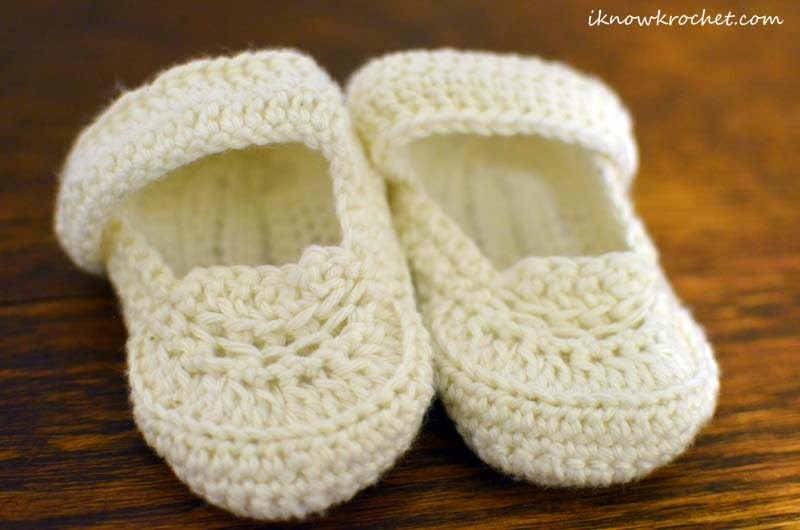 Yes, I had to pay $5.95 for the pattern, but it was worth it because these booties are absolutely adorable and the pattern is written for bulky (or chunky) yarn. I have yet to find a similar free bulky yarn pattern. Sometimes it’s worth spending money on a good pattern. I think of it as a splurge and a gift to myself. I figure $6 is an affordable self-indulgence, especially if you are going to use the pattern to make multiple items as gifts or for sale. In addition to the booties, I wanted to make a matching headpiece. I could have gone with the irresistibly cute matching bulky beanie that is also for sale on Etsy, but I was short on time and money, so I used a free headband pattern. It was designed for lighter weight yarn, but it worked well with bulky yarn. Since it is based on length rather than stitch numbers, I didn’t have to worry about converting the number of stitches from light to bulky weight yarn. I just needed a measuring tape. 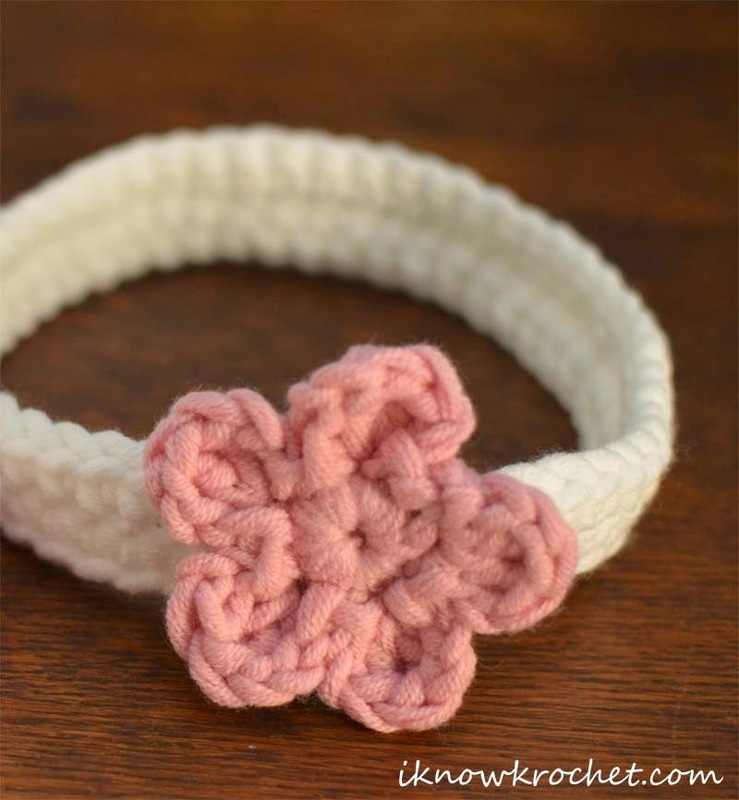 To decorate the headband, I used a free bulky flower pattern written specifically for bulky yarn. 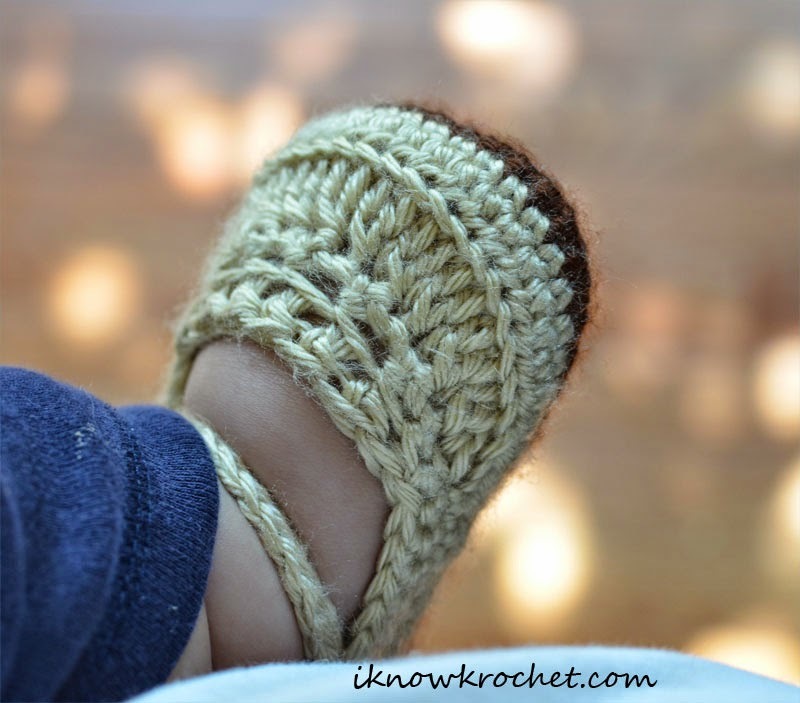 What’s so great about using bulky yarn to crochet tiny booties and a simple headband? The patterns work up VERY quickly! This comes in handy when you are just starting out and may need to crochet a few booties before getting it right. The pattern is so easy that my very first bootie actually looked like the picture in the pattern. The only problem was that it was too tiny. My second bootie was a good size, but my third bootie didn’t match it! 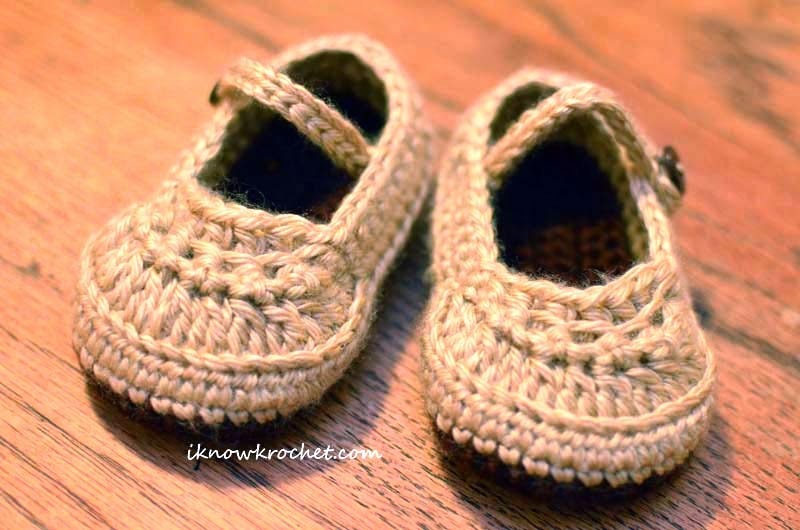 I would say that’s the main challenge with crocheting booties (when you’re a beginner): they have to match! 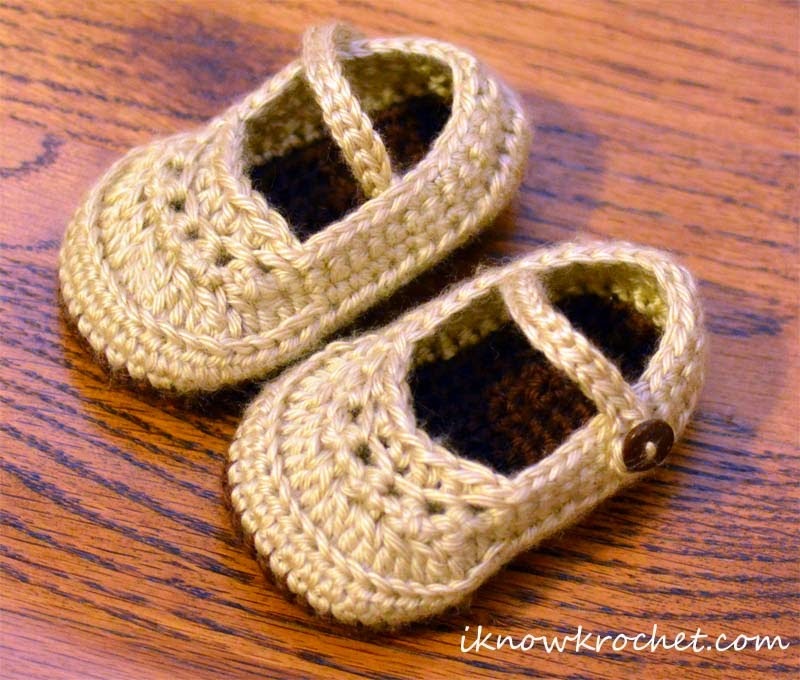 So I crocheted a fourth bootie and gave booties #3 and #4 to my friend, carefully stored #2 so I could make a matching pair someday, and saved #1 as a chew toy (suitable for kids or cats). I also made a headband for the baby’s older sister. I'm a sucker for matching sibling accessories. Since I wasn’t sure of the size, I didn’t sew the band closed, but attached ribbon to both sides. I simply tied the ribbon to each end of the headband using a square knot, then wrapped it around several times to hide the knot. I made sure to seal the ribbon ends so they would not fray. Here is the finished set including the big sister headband. It's my first ever completed crochet project! (I completed it last summer about a month after I first taught myself to crochet). I used the same yarn that is suggested in the pattern. It’s (affiliate link)--> Lion Brand Baby’s First Yarn (bulky #5) and I love working with it. I love the feel of a 45% cotton yarn. I also love 45% (or greater) cotton yarn because it is less "fuzzy" than 100% acrylic. The colors are Cotton Ball and Fairy Tale. To go with the bulky size yarn, the pattern calls for a 6.5mm (aka size "K") hook. At this point in my crochet journey, I decided to buy a crochet hook set. I found an aluminum crochet hook set <--(affiliate link) on Amazon for a great price ($7.16 for 22 hooks). I have already bought two similar sets (because I have a tendency to misplace hooks). You will also need a tapestry needle and stitch marker (optional; see below). One challenge I noticed with these booties (and any bootie crocheted in the round) is keeping track of the very first stitch in each row. Because there is a turn, that stitch tends to get twisted and tightened and I often cannot find it by the time I finish the row. 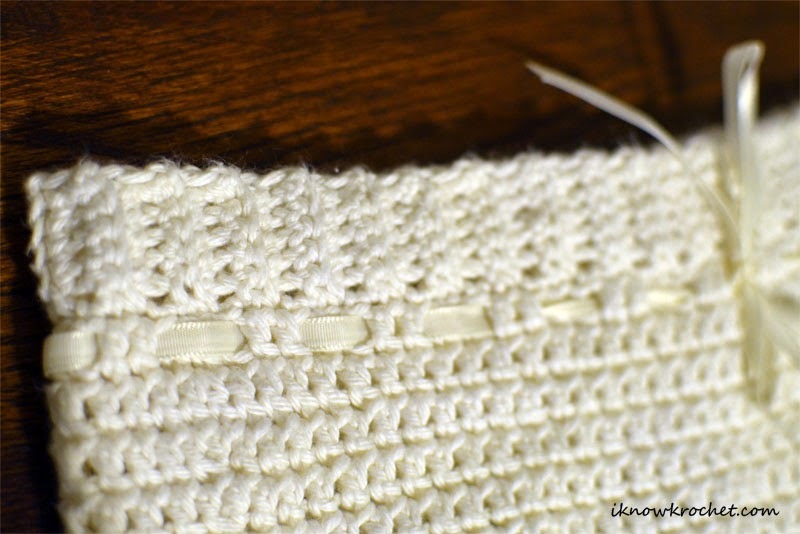 By placing a stitch marker in that stitch, I can make sure that I have the right number of stitches in addition to ensuring that I put the first stitch of the next row in the right place. 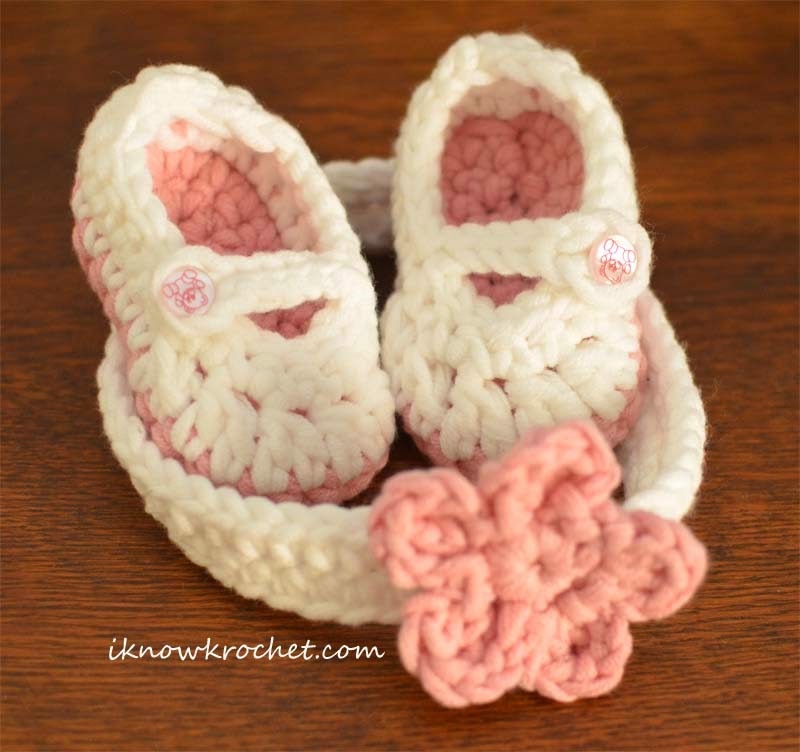 There are a couple of other techniques used in the bootie pattern that may be a small challenge for beginner crocheters, but Elizabeth clearly explains them in the pattern and the accompanying video tutorials. That is one of the best things about her patterns...you can learn a lot from them! Aren't the little bear buttons adorable? What do you think? Would you pay $6 for an irresistibly cute crochet pattern? Ten months ago, I taught myself to crochet using YouTube tutorials. I had tried a book before that, but it was difficult to understand which direction the static pictures were telling me to move my yarn and hook. I greatly appreciate having access to amazing, free online video resources that are the next best thing to a live instructor guiding you at each step. There are countless crochet tutorials on YouTube, but the links below are the tutorials that I chose because they are so easy to follow (you can always push pause to catch up). These tutorials cover everything you need to know in order to get started crocheting, including how to hold the yarn and hook. Isn’t it amazing that all you need to start crocheting is a single skein of yarn and a crochet hook? It's truly the people's craft! 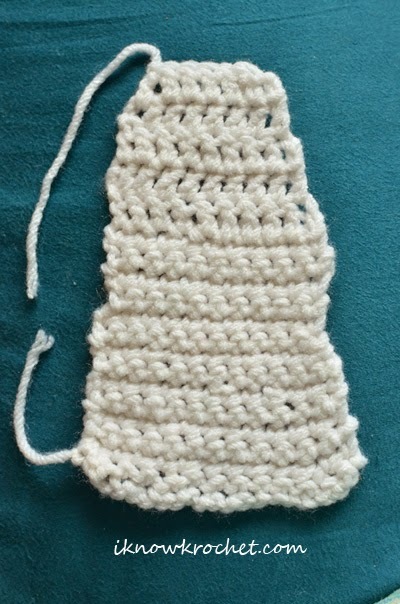 I selected white yarn because it is easier to see each part of your stitches with a light color. 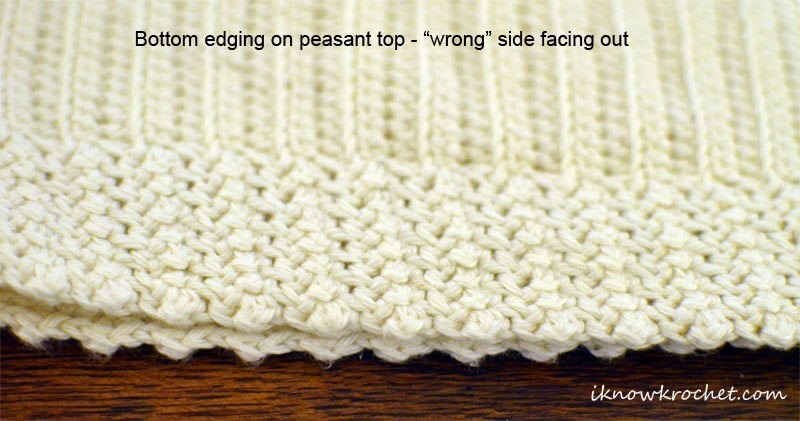 Worsted weight was recommended in the tutorial and is also commonly used in most patterns that I've found. Hook size 5.5mm is what was recommended on the yarn label, but 5mm (aka "H") was recommended in the tutorial and is also a great size to use with worsted weight yarn. Aluminum is a common hook material that is easiest to find in stores in multiple sizes. Once I realized each row was getting narrower than the last, I added five double crochet rows on top of the 14 single crochet rows that I'd already completed, then saved my first ever piece of crochet for posterity. I thought it may come in handy one day for a reason other than wiping a child's nose. It doesn't look much like a dishcloth, but the goal was just to practice the stitches, so I'm calling this one a success. After learning the stitches, all I needed to do was hone my technique (i.e., get comfortable holding the yarn and maintaining consistent tension). I already had all the tools I needed to try following my first pattern! 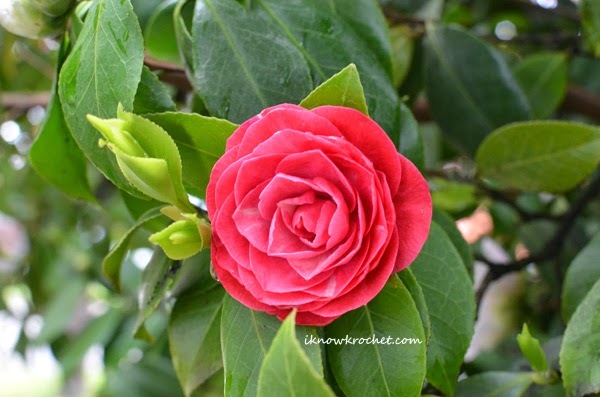 For my first project, I wanted to try something a little more challenging than a dishcloth, so I chose to crochet a flower similar to the one in the picture below. I found a close match on Etsy. It's a crochet rose pattern designed by HappyPattyCrochet. Doesn't it look like the real thing? April Fools! I just had to commemorate the fact that I'm publishing my first ever blog post on April 1st! The truth is, I have not yet crocheted Happy Patty's amazingly realistic flower pattern, but I'd like to one day. All kidding aside, I wanted my first real project to be something special, so I decided to make a blanket for my preschooler. I figured I'd be a master of the double crochet stitch by the time I completed an entire blanket. Since the blanket was going to take awhile, I wanted something a bit more challenging than straight rows of double crochet. After scouring the web for the perfect blanket, I chose this FREE Wavy Chevron Blanket pattern by Paula of CrochetHooksYou.com in order to learn how to make wavy chevrons. 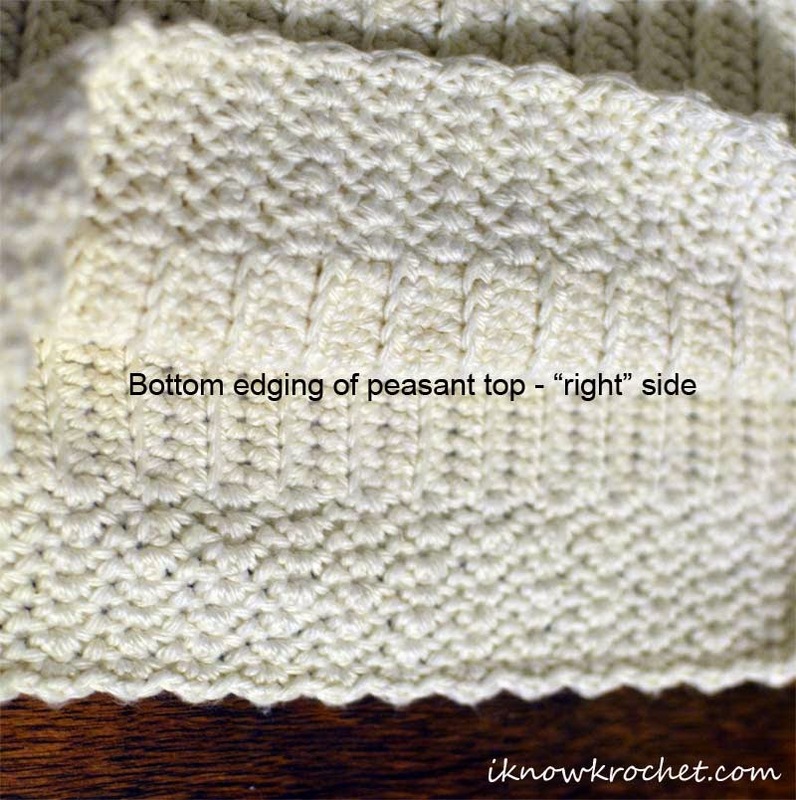 I love this pattern because there is also a video tutorial that goes along with it. Would you like to see a picture of my blanket? So would I, but it's not finished yet (unfortunately, this is not a joke). Although it's possible that I am the world's slowest crocheter, I'm not THAT slow. I have not finished this blanket yet because, after I crocheted my first few rows and proved to myself that I could follow a pattern (i.e., after the "I know Krochet" moment), I found myself searching the web for other cute, easy patterns and discovered...booties! It turns out, I gravitate towards projects that I can complete in a single weekend. I love the feeling of accomplishment that comes from quickly completing a crochet project. That being said, although there are countless fun projects vying for my time and attention, my goal is to complete my first blanket by Mother's Day, which will be a fitting way to celebrate the first anniversary of the day I gave myself the gift of crochet. Are you new to crochet? What did you choose as your first ever crochet project?